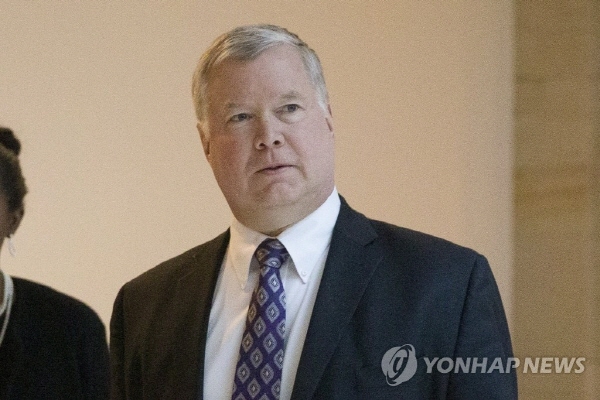 U.S. Special Representative for North Korea Stephen Biegun will travel to Britain this week to seek Europe's cooperation on denuclearizing the North, the State Department said Monday. Biegun is set to visit London on Tuesday to discuss "coordinated efforts to advance the final, fully verified denuclearization of North Korea" with his British, French and German counterparts, the department said in a statement. The envoy has been in charge of day-to-day negotiations with Pyongyang as the United States seeks to dismantle the regime's nuclear weapons program in exchange for sanctions relief. Following the collapse of last month's summit between U.S. President Donald Trump and North Korean leader Kim Jong-un, Washington has appeared to step up efforts to ensure the global sanctions on Pyongyang continue to be enforced.